The Venice International Film Festival has a way of making the time fly–despite the occasional feeling when standing in line for a film that the doors will never open. It seems ages ago that we saw the early-morning press screening of First Man, and yet a mere three days have passed. So far we’ve had the rare experience of each morning seeing another exciting, excellent, thoroughly satisfying film: First Man (which David has already written about), Alfonso Cuarón’s Roma, and the Coen Brothers’ The Ballad of Buster Scruggs. Can this last? Probably not, but the rest of the program offers rewarding films and so far seems to justify journalists’ claims that this year’s festival is boosting its already growing reputation. A new (and laudable) tradition? Last year we reported on the restored print of Lubitsch’s 1923 Rosita, which played on the evening before the official start of the festival, accompanied by an orchestra playing a restoration of the original score, edited and conducted by Gillian Anderson. This year the festival organizers followed up on that success by premiering the restored Der Golem (Carl Boese and Paul Wegener). The large and enthusiastic crowd showed that, given the right presentation, this old film can attract those who think of the festival primarily as a place to see brand-new films before the rest of the world does. In fact, there’s also a healthy restoration thread running through the festival, though silent films tend not to figure in it. 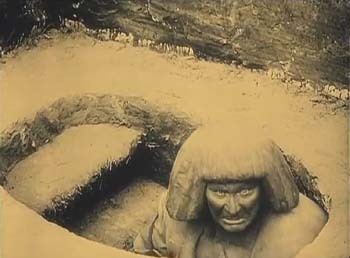 Der Golem is noteworthy as one of a small number of relatively sympathetic Jewish-themed films that came out in the early to mid-1920s in Germany. (I recently wrote about this trend and the newly restored Der alte Gesetz.) It does not manage entirely to avoid stereotypes, but it should be pointed out that the Christian characters come across far worse. 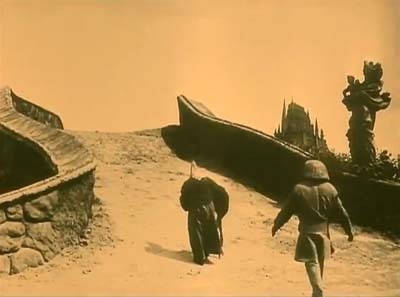 Der Golem is an early entry in the German Expressionist film movement of the 1920s, having come out in 1920, the same year as Das Cabinet des Dr. Caligari. 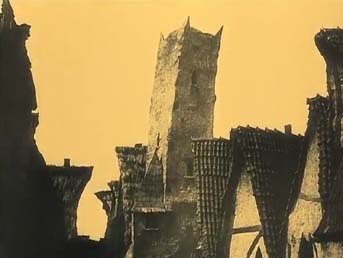 Rather than using painted flats to create a stark, graphic look, as Caligari did, Boese and Wegener’s film features the droopy-clay look employed by Hans Poelzig, perhaps the finest of the Expressionist architects of the day. The result is that the clay buildings of the ghetto and the clay Golem seem at times to merge into each other. The print looks much better than previous copies available. The Belgian Cinematek held an original negative, thought to be the one for German distribution, rather than the second negative shot for foreign distribution. Prints held in other archives supplied missing footage, as well as tinting and toning information and the graphics for some of the intertitles. The drop in clarity is apparent in the replaced passages, which, interestingly, include the sequence in which Rabbi Löw summons a demon to give him the magical name that will bring the Golem to life. Why this key moment was removed from the negative will probably remain a mystery. The musical accompaniment was a modern composition by the six members of the Mesimér Ensemble. It fits the current fashion for highly dissonant scores, including the seemingly de rigueur vocal passages. It went well with the film. I hope the festival organizers will continue this tradition of presenting restored silent films with musical accompaniment as a prelude to the festival. It makes for a relaxing transition into the more film-filled days to come. After the critical and commercial success of Gravity (2013), which I wrote about here and here, there has been much curiosity about Alfonso Cuarón’s long-anticipated next film, Roma. Advance word had it that the film was to be shot in Mexico and in Spanish. As I’ve already suggested, the film is splendid, and its black-and-white, widescreen images looked great on the huge Salla Darsena screen (from front row, center, of course). As with Zama last year, at the end David asked if we had just seen a masterpiece. Again neither of us had any doubt that we had. The film may be based on Cuarón’s childhood memories, but it is hardly autobiographical. Instead the protagonist is Cleo, one of the indigenous maids who work for the upper-middle-class family whose dramatic arc parallels her own. Conventionally the maids Cleo and Adela would be present in the backgrounds of scenes or at best be supporting characters. Instead Cleo is our identification figure. Indeed, of the four children of the family, three of them boys, we never have a clue as to which one might represent the director. The double plot revolves around two desertions. First the husband and father of the family departs on an ostensible trip to a conference in Canada, which is soon revealed as a cover for his leaving his wife for another woman. AT the same time, Cleo is dating a man who professes to love her but who deserts her the moment she reveals she is pregnant. One might expect this sympathetic tale centered largely around Cleo to center on the family’s harsh treatment of her. Instead, the cruelty is muted and casual. The children clearly adore her, and she them, and the wife says at one point that she loves Cleo as well. Far from firing Cleo upon learning of the pregnancy, the wife comforts her, pays for medical treatment at the family’s hospital, and buys her supplies that she will need. Yet the unkindness is apparent as well. The wife curtly tells Cleo to clean up the dog turds in the courtyard–the accumulation of which provides a running gag. She also carelessly leaves Cleo, who cannot swim, to watch the unruly children at a beach with dangerous waves. 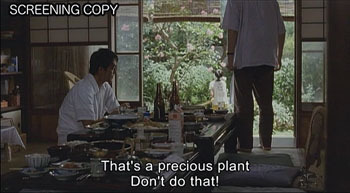 This unreasonable demand precipitates one of the film’s most dramatic scenes, shot in an excrutiatingly suspenseful long take. 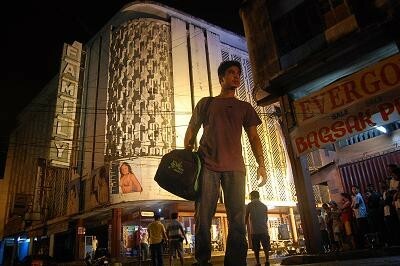 Cuarón directs with his usual utter control and flair. The film is set in 1971 (when the director would have been ten years old), and the period details are impeccable–especially the family’s Ford Galaxie, which provides a running gag whenf characters try to maneuver it into a narrow garage. There are the expected long takes and camera movement. One fast tracking shot races along the middle of a busy street, keeping up with Cleo and Adela as they run joyously along block after block to enjoy their time off (top). 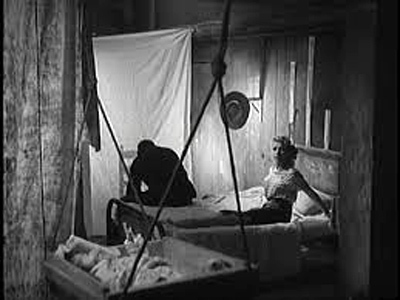 In another scene, the camera wanders around the upper floor of a furniture store as Cleo shops for a crib, only to end with a pan to the windows and the revelation of the street below full of rioters. In the ongoing controversy over Netflix’s reluctance to release its productions in theaters, it is particularly ironic that it should be the studio to produce Cuarón’s big-scale film. The promise is that it will be released “in select theaters.” If you live near one of those, don’t miss it. 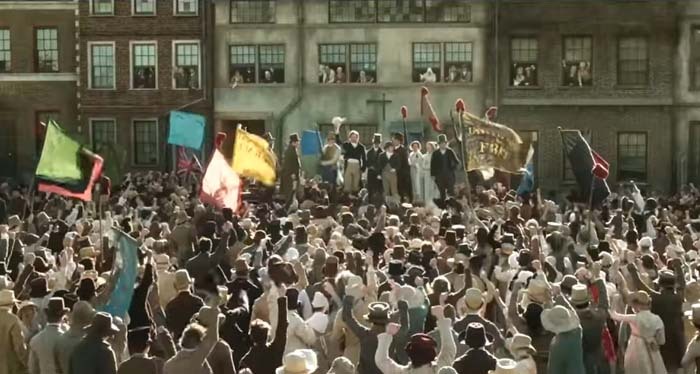 I had hopes of medium height that Mike Leigh’s Peterloo would live up to his previous historical films, Topsy-Turvy (1999) and Mr. Turner (2014). It turned out that Leigh had taken on a project with nearly insuperable obstacles. While Topsy-Turvy had Gilbert and Sullivan, with its musical numbers and the innate drama of the pair’s occasionally testy relations, and Mr. Turner had painting and a single eccentric personality to focus on, Peterloo is about radical politics. The Peterloo massacre of 1819, which perforce occurs only in the climax of the two-and-a-half-hour film, is a major incident in the history of British radicalism and reform, and it is relatively well-known to the citizens of Great Britain. Elsewhere audiences are likely to be unaware of it. As a result, Leigh must present a great deal of exposition about the issues and the lead-up to the peaceful protest march at St. Peter’s Field in the Manchester area. The exposition takes the form of a long series of speeches and conversations about those issues. The speeches are largely taken from the historical record, and they impart a great deal of authentic historical information, but they frequently overwhelm the drama. Many of the speakers are historical characters, about whom we learn relatively little. Leigh humanizes the situation by focusing at intervals on a single poverty-stricken family whose adult men work at the local weaving mills and face dwindling wages from the mill-owners.The opening is clearly intended both to provide a bit of violent action as a hint of things to come, much later, and to introduce us to a young bugler who belongs that poverty-stricken family. We follow his trek home, his arrival there, and, briefly, his fruitless search for work. If we expect him to become an active protagonist, however, we are disappointed, for he recurs only occasionally and passively thereafter. Instead we move around the various occasions on which speeches are given to rouse the downtrodden population to action. 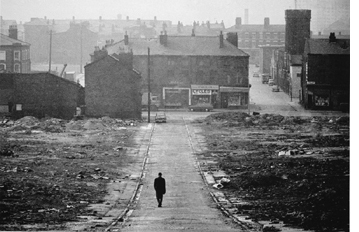 It must, after all, be plausible that roughly 70,000 people from the area would assemble in Manchester for a peaceable demonstration for the vote and representation in Parliament. The local politicians who attempt to thwart the protest and possible resulting violence are portrayed as old, ugly, and nearly hysterical in their mingled fear of and contempt for the working classes. 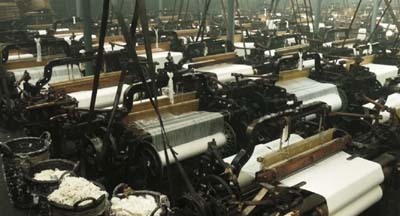 Their fears aren’t entirely unreasonable, given that the Luddite movement of 1812 led workers to destroy the labor-saving automatic looms and occasionally the factories that held them. Violence had killed people on both sides of the struggle. Leigh perhaps hints at the “machine-breakers” in his shots of the vast mill interior (above) and some of the dialogue, but only someone familiar with British history of the era would link the Peterlook protestors to the Luddites. The result somewhat resembles the Soviet Socialist Realist films of the 1930s and 1940s, with their noble peasants and caricatured bourgeoisie and government officials. Not that there’s anything wrong with that, exactly, but the Soviet films seldom tried for actual realism, and Leigh cannot entirely give up his passion for naturalism. The result is an uneasy mixture in Peterloo‘s tone. Despite its faults, the film is impressive. Produced, again ironically, by Amazon, the film has what must have been Leigh’s biggest budget to date. Authentic costumes have been created for actors and extras enough to at least suggest the tens of thousands present that day (below). The mill and the surrounding slum are convincing, and Leigh has managed to find some unspoiled landscapes to provide a relief from the grimness of working-class life in the era. Amazon will release it in the US on November 9, as part of the film’s slightly premature celebration of the 200th anniversary of the event. Check out our Instagram page for ongoing photos from the festival. As ever, thanks to Paolo Baratta, Alberto Barbera, Peter Cowie, Michela Lazzarin, and all their colleagues for their warm welcome of us to this year’s Biennale. October 31, 2018: Netflix has announced that it will give Roma a theatrical release, starting on November 21 in New York and Los Angeles; it will be in more theaters starting December 7 and open wider on December 14. It will been seen theatrically in 20 countries. There will be several theaters showing it in 70mm. Lucky to Be a Woman (1955). How to sum up nine days of Cinema Ritrovato? I logged thirty-two features and half as many shorts and fragments, along with a few panels and workshops. Fate cursed me with the need to blog and to sleep, so I missed many prime items. And that’s including my (sad) decision not to revisit films I’d already seen, so I sacrificed new exposure to masterpieces from Ozu, Mizoguchi, Feuillade, Leone, de Sica, etc. In this last Bologna roundup, all I can do is wave at some of the surprises and discoveries that captivated me. Many of my pals praised the Mexican noir Western Rosauro Castro (1950), which I had to miss, but I did get compensated by Prisioneros de la Tierra (1939), an Argentine classic of romantic realism. The plot concerns the exploitation of peasant migrants forced to work in dire conditions. One scene, of a drunken doctor in the throes of the DTs, got a rise out of Jorge Luis Borges. Even more shocking was the red-light melodrama Víctimas del Pecado (1951, above) by the great Emilio Fernández. A newborn baby dumped into a garbage can; a preening, sadistic pimp who can smoke, chew gum, and dance frantically at the same time; a nightclub dancer who tries to live righteously but winds up in prison for her pains; and several splashy music numbers–who could resist this? Not the Bologna audience, who burst into applause when, after slapping a child silly, said pimp got a quick and violent comeuppance. Of course the gorgeous cinematography of Gabriel Figueroa contributed a lot: One shot of a train blasting black smoke into the night would be enough to exalt a far less delirious movie. Thanks to Dave Kehr of MoMA, who brought a sampler from his recent Fox retrospective, and to UCLA and other sources, aficionados of American studio cinema had no shortage of delights. Monta Bell’s Lights of Old Broadway (1925) gave Marion Davies a dual role as twins separated at birth and she made the most of half of it, playing a no-nonsense colleen who makes it big at Tony Pastor’s. Part of the fun was the film’s historical references: Teddy Roosevelt as an undisciplined schoolboy, Weber & Fields as a kiddie act, and a solicitous Thomas Edison urging the heroine to invest in electricity. Ten years later, One More Spring (1935, above) from Henry King offered a gentle seriocomic Depression tale. 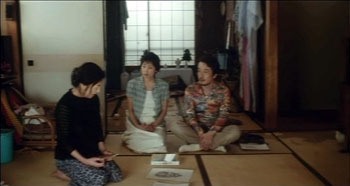 Two homeless men squatting in a garage take in a woman who sleeps on the subway, and they try to make ends meet with the help of a kindly old couple. At first engagingly episodic in the McCarey manner, the plot gets more tightly bound when the old couple faces the loss of their savings. Janet Gaynor is endearing, as usual, and Warner Baxter brings his clipped energy to the role of a hopelessly optimistic failure. There are no villains. The banker struggles to save his depositors, though he’s frank enough to admit, “It’s all the fault of the Republicans. Still, I’ll vote for them in the next election. With the Democrats you never know what to expect.” Another big laugh from the crowd around me. 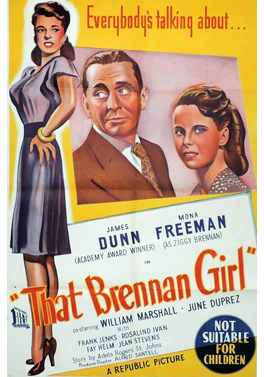 That Brennan Girl (1946) exemplified the opportunities that the boom in 1940s moviegoing offered downmarket studios. Apart from the second-tier cast and the warning “Not Suitable for Children,” the production’s B-plus aspirations were clear, yielding a surprisingly polished Republic picture (buffed up by a beautiful Paramount restoration). A woman raised by a predatory mother takes up petty theft and con games. She reforms, but after becoming a war widow she falls back into her old ways–endangering her baby in the process. That Brennan Girl could have served as an example in my Reinventing Hollywood book, since it flaunts a long flashback punctuated by dreams and bits of imaginary sound. Those narrative stratagems pervaded films at all budget levels. Another 1940s technique was the chaptered or block-constructed film, Holy Matrimony (1943), a genial comedy about switched identities, contains sections with titles like “But in 1907” and “And so in 1908.” The film, about a painter brought back to London from his tropical hideaway, reworks the Gauguin motif made famous by Maugham’s Moon and Sixpence (1919). Was this release an effort to build on Albert Lewin’s 1942 version of the novel? Monty Woolley plays himself, but Gracie Fields brought real warmth to the clever, ever practical woman who marries him. Holy Matrimony was a welcome, if minor entry in the John Stahl retrospective. I had to miss the much-praised When Tomorrow Comes (1939) but was happy to break my rule of avoiding things I’d seen before when I had a chance to revisit Imitation of Life (1934). I persist in thinking this better than the Sirk version, not least because of its harder edge. Beatrice Pullman’s exploitation of her servant Delilah’s pancake recipe carries a sharp economic bite, and the brutal classroom scene yanks our emotions in many directions. (While Peola writhes in her seat, her mother asks innocently, “Has she been passin’?”) As in Stahl’s other 1930s efforts, his studiously neutral style is built out of profiled two shots in exceptionally long takes. 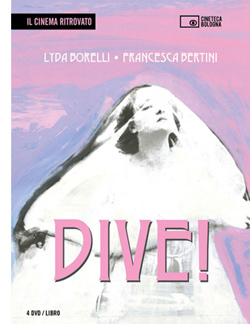 Ritrovato has always done well by its diva films, under the curatorship of Marianne Lewinsky. (They’ve just released a hot-pink box set of four classics.) In tribute to 1918 there were several star vehicles. I’ve already mentioned L’Avarazia (1918), an installment in a Francesca Bertini series devoted to the seven deadly sins. 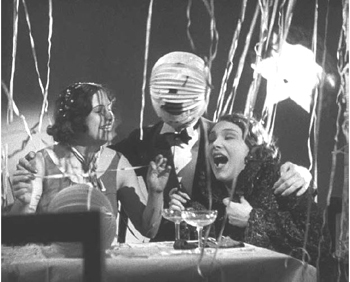 Another high point was La Moglie di Claudio (1918), an exemplary tale of excess. When a movie starts by comparing its heroine to a spider, you know she means trouble. Cesarina (Pina Minichelli) two-times her husband, has an illegitimate child, flirts relentlessly with her husband’s protégé, collaborates with spies, and steals the plans to the cannon the husband has designed. She does it all in high style. As she dies, she falls clutching a window curtain. 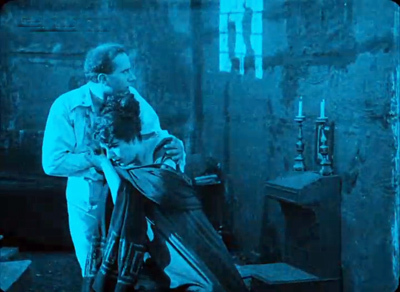 In a fragment from Tosca (1918), we got a quick lesson in the illogical powers of cinematic composition. Tosca (Bertini again) visits her lover Mario in prison. Their furtive conversation is played out while the shadows of the guards come and go in the background. That’s a source of some suspense for us. And for the couple as well. Instead of looking left at the offscreen window itself, which they could easily see, they–like us–turn to monitor the silhouettes. It’s a nice variant on the background door or window so common in 1910s film. Of all the surprises, the biggest for me was This Can’t Happen Here (aka High Tension, 1950), an Ingmar Bergman thriller. You read that right. This Cold War intrigue shows spies from Liquidatsia (you read that right too) infiltrating a circle of refugees living in Sweden. The first half hour is soaked in noir aesthetics, with men in trenchcoats glimpsed in bursts of single-source lighting. The preposterous plot gives us a briefcase full of secret papers, attempted murder by hypodermic, torture scenes, and enemy agents acting impossibly suave at gunpoint. A cadre meets in a movie theatre playing a Disney cartoon, with Goofy’s offscreen gurgles punctuating an informer’s confession. 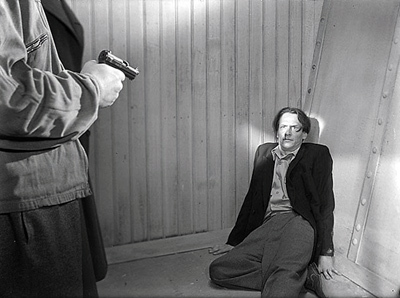 Bergman forbade screenings of the film, but Bologna was given the rare chance to reveal another side of his obsessions with brooding solitude and the pitfalls of love. Peter von Bagh’s illuminating essay included in the catalogue rightly emphasizes how in This Can’t Happen Here murder becomes the natural outcome of an unhappy marriage. My visit was topped off by the charming Lucky to Be a Woman (1955) in the Mastroianni strand. Sophia Loren, looking like a million and a half bucks, plays a working girl accidentally turned into tabloid cheescake. Mastroianni is a louche photographer who can make her career. Bantering at breakneck speed, they thrust and parry for ninety-five minutes, all the while satirizing modeling, moviemaking, and the itchy palms of philandering middle-aged men. 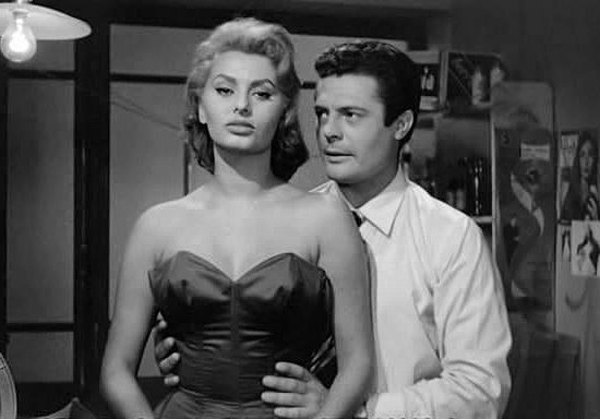 Mastroianni spins minutes of byplay out of an unlit cigarette, while La Loren plants herself like a statue in the foreground, facing us; if Marcello’s lucky, she may address him with a smoldering sidelong glance. What’s not to like? After thirty-two years, Ritrovato’s magnificence is unflagging. As usual, thanks must go to the core Ritrovato team: Festival Coordinator Guy Borlée (with appreciation for help with this entry) and the Directors (below). They and their corps of workers make this vastly complex celebration of cinema look easy. It’s actually a kind of miracle. Ehsan Khoshbakht, Cecilia Cenciarelli, Mariann Lewinsky, and Gian Luca Farinelli. David’s recent entry stressed the world-wide scope of offerings here at Il Cinema Ritrovato. The time period covered is even broader–this year as broad as it could possibly be. The final night’s film in the Piazza Maggiorre will be Agnès Varda and JR’s prize-winning documentary straight from this year’s Cannes festival, Visages Villages, with Varda here to introduce it. Yesterday we saw a work that may have been created before the cinema itself had been properly invented. Somewhere in the time period 1888 to 1904, French scientist Etiennes-Jules Marey created a huge photographic format, a filmstrip 88 mm wide and 31 mm high. He exposed a series of images along this broad strip but never intended to project them as a film. As with much of Marey’s work, these high-quality photographs were tools to allow him to analyze movements, in this case those of humans and horses in the Place de la Concorde. The National Technical Museum in Prague has scanned this series of frames to create a digital copy that can be projected in motion. The results, lasting only 45 seconds, has a clarity and detail that seems to rival that of Imax film. (The image at the top only hints at the effect.) We watched the piece four times and would have been glad to see it at least as many more. A major thread running through the festival is the year 1897, which, although only the second year of the established film industry, already saw the making of many beautiful and intriguing films. Among the ones shown here were films made by the American Mutoscope Company (later known under the more familiar name, American Mutoscope and Biograph) and British Mutoscope and Biograph. 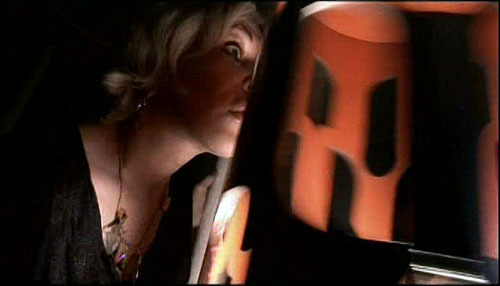 These films, made to be shown in both peepshow machines and projected onto screens, utilized a 68 mm format. Such films have mainly been seen in poor prints that give an impression of primitive crudeness. Thanks to preservation work on collections in the EYE Filmmuseum and the BFI-National Archive, the richness and clarity of these films have become evident, and they look anything but primitive. 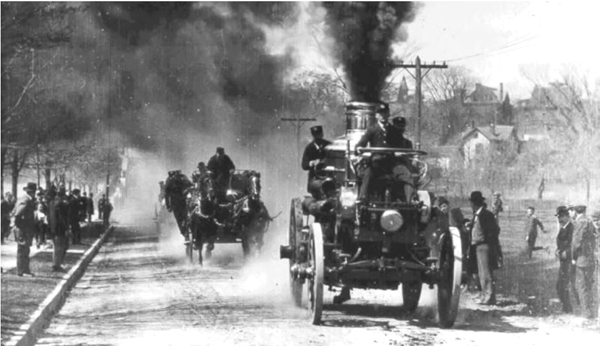 One American film (above) is Jumbo, Horseless Fire Engine, credited to William Kennedy-Laurie Dickson himself, provides what must have been an exciting variant on the many films featuring horse-drawn fire engines racing along streets. One of the Lumière company’s most prolific traveling cameramen was Alexandre Promio. 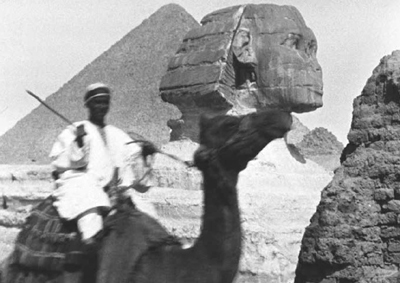 I was naturally intrigued by series he filmed in Egypt in 1897. One thing that struck me about 28 films in the program was how few featured famous tourist attractions and truly picturesque images. True, Les Pyramides (vue générale) shows one of the most familiar ancient sites in the world, the Sphinx against the great pyramid of Khufu. Most of the rest of these brief films are remarkably mundane, however. Place de la Citadelle shows an open space with a nondescript building in the distance rather than the two main attractions of the Citadel, the Mosque of Mohammed Ali and the spectacular view out over the city. Village de Sakkarah (cavaliers sur ânes) shows fellahin riding donkeys in modern Mit Rahina, but in the background the colossal quartzite statue of Ramesses II lies on the ground (where it still lies today, covered by a shelter). It is a beautiful statue, visited by nearly all tourists, and yet in the film it is merely a distant, vague shape, identifiable only to those who are familiar with it. Numerous other views are moving, taken either from trains and showing ordinary industrial buildings or from boats, showing mainly palm trees. The collection leads one to speculate what prompted Promio to choose his subjects. 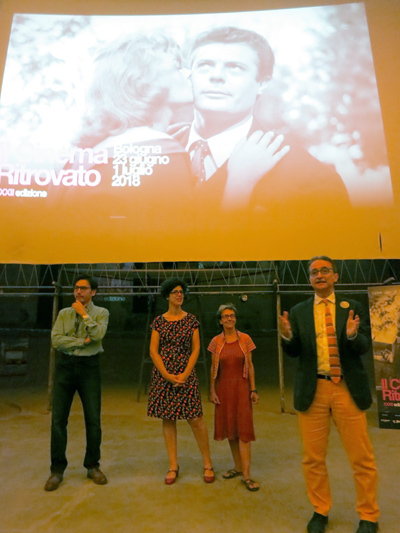 I believe the tradition of showing films in the open air of the Piazzetta Pier Paolo Pasolini (the courtyard of the Cineteca di Bologna) on carbon-arc projectors began in 2013, which I reported on it. This popular feature has expanded, with three programs this year. The first centered around Addio, Giovenezza!, which David described in his entry. 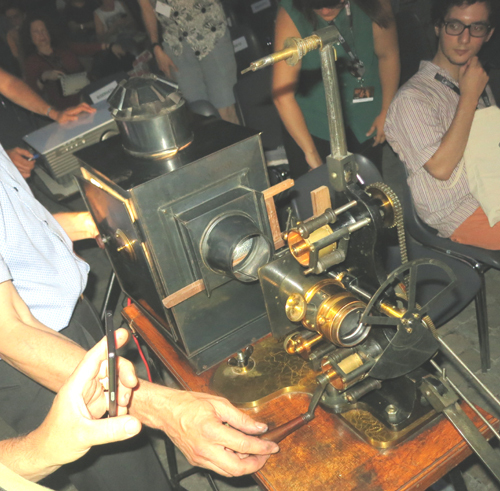 The second was particularly special, with a five early shorts ranging from 1902 to 1907 shown on a vintage 1900 projector, hand-cranked by Nikolaus Wostry of the Filmarchiv Austria. The films were charming, but the star of the show was the projector. It looked like a magic lantern dressed up with special attachments that allowed for moving pictures, including a shutter sitting in front of the lens rather than within the body of the lantern. Indeed, the thing looks like a magic lantern converted into a film projector. 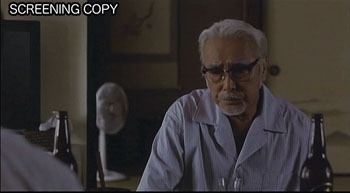 Although there was some thought of ending the Cento Anni Fa programs once the feature film became established, that has fortunately not been done. 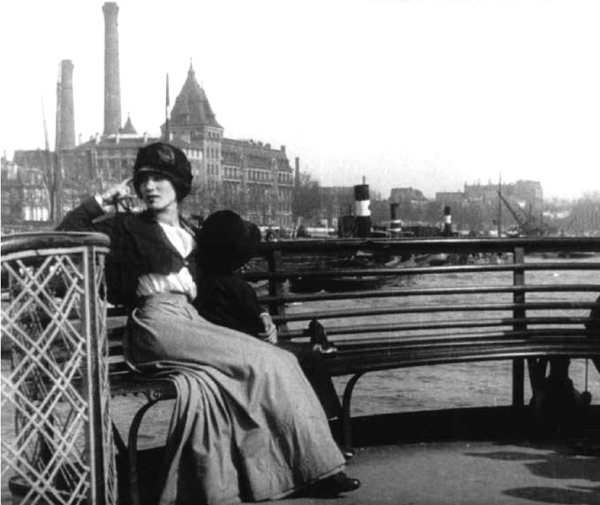 Instead, a mixture of shorts and features continues to celebrate the cinema of a century ago. Some of the Italian films David wrote about came from that year. I had the chance to see two masterpieces from that year back to back: André Antoine’s Le coupable and Victor Sjöström’s The Girl from Stormycroft. Both center around the subject of women seduced and left pregnant by their selfish lovers. I had never seen Le coupable. Antoine is often referred to as a naturalist theatrical director, but going by Le coupable and La terre (1921), he is equally a major film director in the realist tradition, though his output consisted of only nine films from the brief period 1917 to 1922. 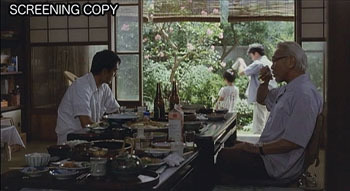 While La terre was filmed largely in the countryside, Le coupable was shot in the streets of Paris, and many of its interiors seem to be set in real rooms. Antoine manages to combine the gritty realism of his lower-class milieux with beautiful cinematography (see bottom image). The story takes the unusual form (for its day) of a lengthy series of flashbacks framed by a trial of a young thief and murderer. The past does not unroll from witnesses’ testimony, however, but from one of the presiding judges’ lengthy confession that he is the father of the accused and had abandoned the boy’s mother. The situation is pure melodrama, but Antoine’s light touch and feel for the settings of the action make it a masterpiece. 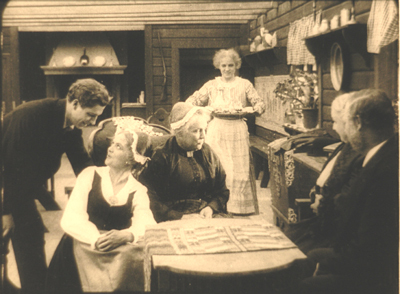 The Girl from Stormycroft has the distinction of being the first adaptation of a novel by internationally popular author Selma Lagerlöf, whose work was to be the basis for several classics of the Swedish silent cinema, including The Phantom Carriage and Stiller’s The Saga of Gõsta Berling (1924). 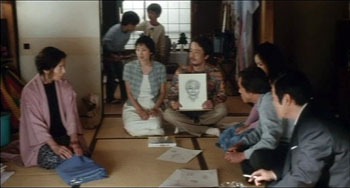 It is set in the countryside, in a group of small villages. Helga, the heroine, has been seduced by a married man who refuses to acknowledge her child as his own. In a key trial scene, she gives up her suit against him to prevent his committing a sin by swearing to a lie on the Bible. This gains the admiration of a well-off and kind young man, Gudmund, who persuades his mother to take Helga on as a maid. When his fiancée and her parents visit Gudmund’s family, they express disgust at her presence and depart (above), leaving Gudmund is left with doubts about his upcoming marriage. Il Cinema Ritrovato’s programs offer an opportunity to sample early sound films from a much wider range of countries than usual. Gustav Machaty, best known for Ecstasy (1933), made From Saturday to Sunday in 1931. It follows a pair of working girls who go out to a ritzy nightclub with two wealthy men, intending to exploit the two for a lavish night out while avoiding their sexual demands. This proves more difficult than they expected, and we end up following one of the pair as she is stranded late at night in the pouring rain. As the title suggests, the action is a slice of life, lasting less than 24 hours. Machaty manages to blend the visual style of the late 1920s with a firm grasp of sound technology. 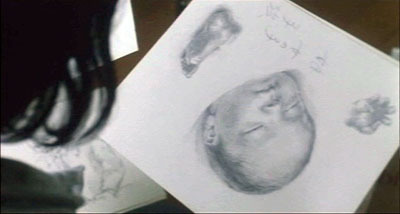 The result is an entertaining if rather conventional tale. Mexican filmmakers seem to have proved equally adept at taking up sound. The program notes for the program “Rivoluzione e avventura: Il Cinema Messicano dell-Epoca d’Oro” point out that Mexican production burgeoned in the 1930s, going from one feature in 1931 to 21 in 1933. 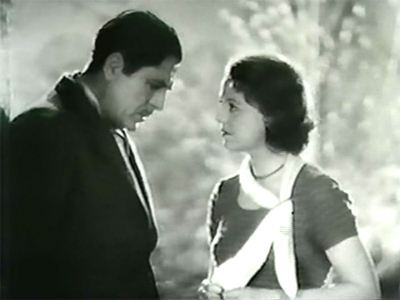 The earliest film in this thread, El Compadre Mendoza (1933), is a technically and stylistically impressive film, looking like a Hollywood film of the same era. 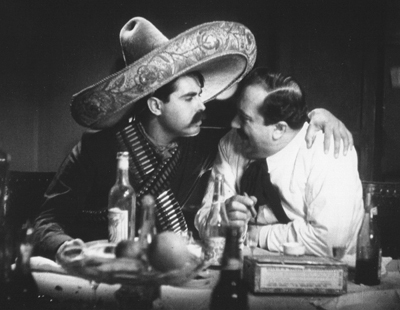 It’s part of a trilogy about the Mexican Revolution, coming between director Fernando de Fuentes’ El prisionero 13 (1933) and Vámonos con Pancho Villa (1935), though it is quite comprehensible and enjoyable on its own. The irony of the title is that the protagonist, a jovial, sociable plantation owner, is professing loyalty to both sides, and for years he manages to live a pleasant life with his family and staff on their large hacienda. 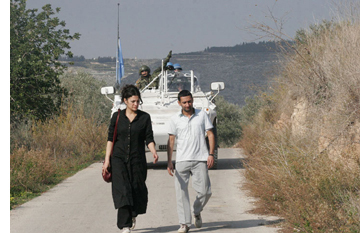 The film is remarkable in portraying the Revolution almost entirely offscreen. The narrative sticks mostly to Mendoza’s house, and we gauge the progress of the fighting purely through a series of sequences in which either revolutionary or government troops ride up the long, tree-lined road to the house. There Mendoza and his household provide a bit of socializing, putting up an effective façade of loyalty to whichever army is present at the time. Mendoza develops a particular friendship with Felipe, a Revolutionary general (above), who also attracts Mendoza’s young wife in what develops into a lengthy unconsummated romance. Inevitably Mendoza’s juggling of the two sides collapses as he is forced to help one of them against his will. For me the most unexpected discovery of the festival was the second Mexican film, Two Monks (1934). It is considered the first in the Mexican Gothic genre. 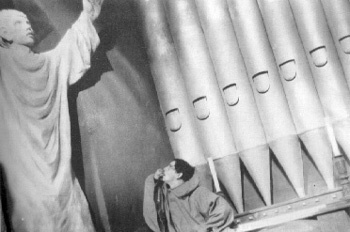 It was inspired by the Spanish-language version of Dracula (directed in 1931 by George Melford for Universal), as well as by German Expressionist films. There are no monsters in the film. Instead, a frame story set in a monastery that looks straight out of Murnau’s Faust (1926) introduces a young monk, Javier, who has gone mad. He attacks another monk, Juan, with a crucifix and confesses to the prior that he did so because Juan had committed a terrible crime. A lengthy flashback lays out the story of Javier’s love for Ana and his eventual rivalry with Juan. 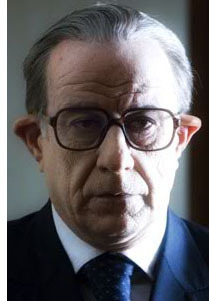 In the second half, Juan also confesses, and the story is repeated from his point of view. Scenes we saw earlier are replayed, often starting at an earlier point or ending at a later way, in a way that alters our understanding of the two monks’ past relationship. 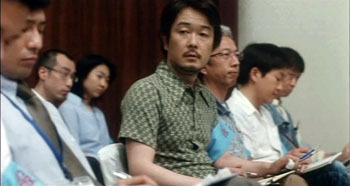 The result is not a Rashomon-type situation, for the two men agree on the events they describe, disagreeing only on the implications of those events. It’s a remarkable narrational technique for this early in film history. The atmosphere claustrophobia created by the small cast (no passers-by are seen in the brief street scenes and no servants appear in the houses) and of dread created by the sets and the dissonant music of the climactic scene would bear comparison with the horror films of Universal and Hammer. Film restoration has been around for decades, but at some point within the several years I noticed that an increasing number of films were being restored were ones that I had seen when they first came out or shortly thereafter. Modern classics restoration wasn’t just for silent films and movies from the golden studio era. Now they’re for modern classics: The Graduate, Belle du jour, Women in Love, Blow-Up, and Day for Night (not to mention the restorations shown at Il Cinema Ritrovato in past years). My first thought is, why do such recent films need restoration? Answer: maybe they’re not as recent as they seem to me. My second thought is, haven’t the studios realized that they need to take care of their films? Answer: Yes, to some extent, given the vital work done by studio archivists like Grover Crisp and Shawn Belston. Still, will There Will Be Blood be neglected until it needs restoration in twenty years’ time? Among the relatively recent films presented in restoration here is Med Hondo’s West Indies (1979). The Film Foundation’s World Cinema Project undertook to restore a number of films by Hondo, a Mauritanian actor and director and one of the most important directors from the African continent. 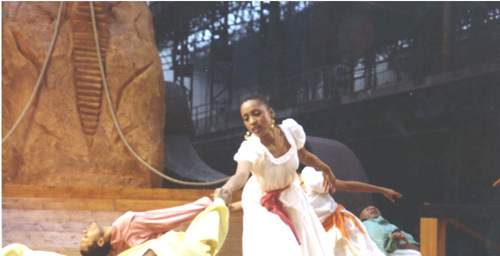 West Indies is a remarkable film, a musical on the history of French slave-owning in its Caribbean colonies. Inside an empty factory Hondo built a large set depicting the upper and lower decks of a slave ship. The various sections of this ship provide stages upon which scenes, anything from a 1968 demonstration in the streets of Paris to a slave auction hundreds of years before. Five actors representing colonial interests, including a black man who cooperates in order to maintain his position as a figurehead governor, take similar roles throughout the action. It’s a lively, entertaining film, done in color and widescreen, as well as a maddening look at French complacency and casual cruelty. Most of the muscial numbers are dances rather than songs, with Hondo himself having choreographed several of them. 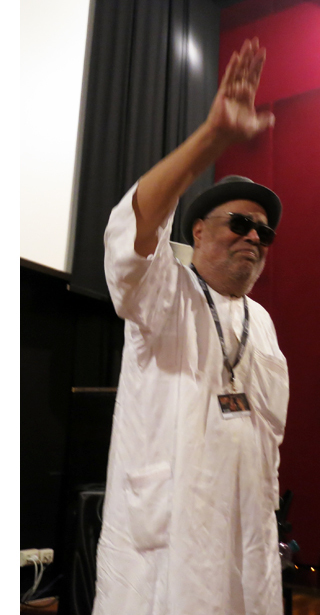 Hondo, now 81 and reportedly seeking backing for another film, was present at the festival and introduced the screening of West Indies that we attended. He was visibly moved by the chance to show this little-known work to an appreciative audience and thoroughly won us over during his brief presentation. With luck we will see a tenth film from him. Thanks to Guy Borlée for his assistance with this blog, and to the programmers and staff of Ritrovato for another dazzling year. You can download the entire festival catalogue here. 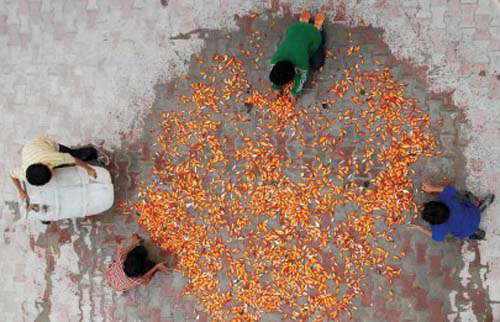 Kelley Conway reviewed Visages Villages at Cannes for our blog.